BRATISLAVA, April 10 (Xinhua) -- In exactly one month from the IIHF Ice Hockey World Championship that starts on May 10 in Slovakia, the organizers unveiled on Wednesday the design of the medals that will be awarded to teams on the podium. The medals were designed in Slovakia and the designers have been granted full artistic freedom. "The only restrictions were the maximum allowed diameter and round shape," said Igor Nemcek, the director of the organizational committee of the tournament. 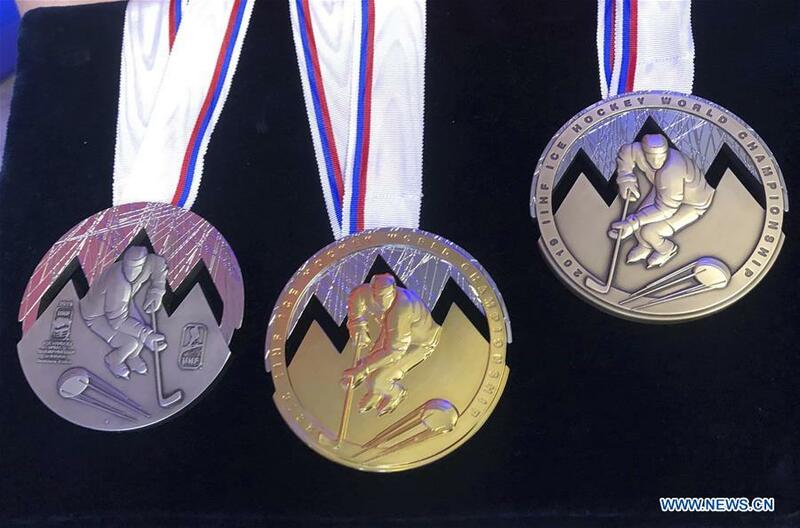 Leading designer Peter Packan chose the theme of a hockey player and Slovak mountains, depicting the three most famous peaks in Slovakia on the medals. There will be 33 pieces of each kind of medal made, weighing 350 grams each. The IIHF Ice Hockey World Championship will be held from May 10-26 in two Slovakian cities of Bratislava and Kosice.